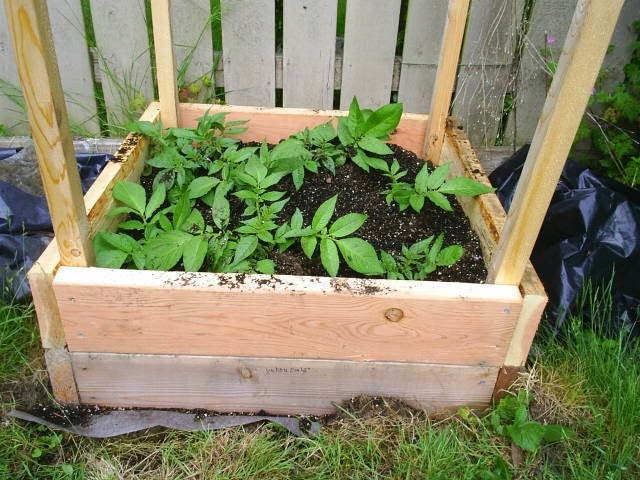 Sinfonian's Potato Bin Page: Build-As-You-Grow Potato Bins! 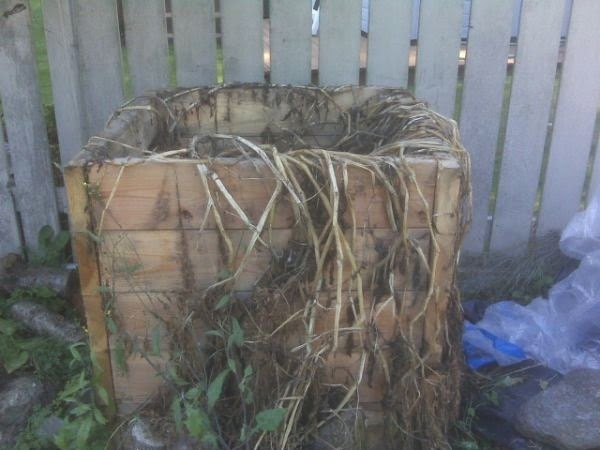 You may have read about my obsession with finding the perfect potato bins to grow potatoes outside my SFG. This was both to save space in the garden for other plants, and to achieve a greater depth of potato harvest than my 15 inch beds could allow. Yes, I know I could have raised the potato section higher, but I defer to my first point. Of course I researched other options, from tires to garbage cans to compost bins, but this method really caught my eye for someone with severe space constraints and a desire for larger potato yields for storage. Let me say that there are 100 ways to grow a tomato, so to each their own. Enjoy! 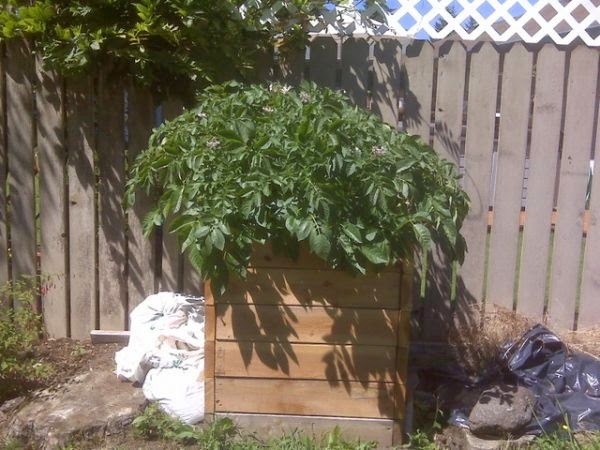 So, thanks to Judy finding this article (Seattle Times article on Potato Bins) in my hometown newspaper, Greg Lutovsky, who has been farming potatoes commercially for over a decade shared the perfect option for any size bin I find room for in my garden. 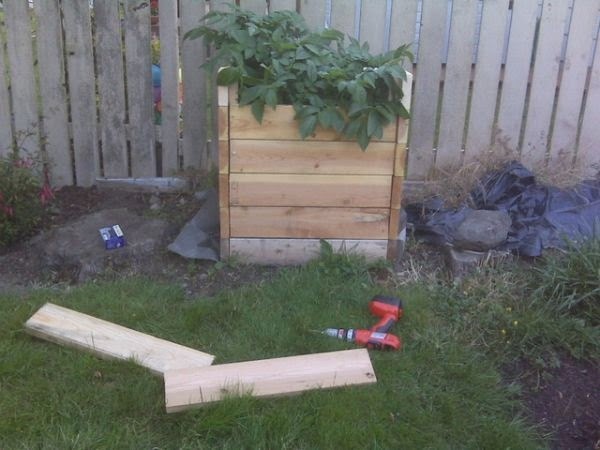 So this page is devoted to the building of my two potato bins, one for my Organic Buttes and the other for my Yukon Golds. I'll still try to include what I'm doing in my blog, but this can hopefully be a central location all about my potato bins. **NOTE - EDIT** Greg from Irish-Eyes Garden City Seeds let me know that Yukon Golds, and all early varieties set fruit once and do not do well in towers. You only get potatoes in the bottom 6 inches, which is what I got. Late season alternatives to yukon gold are Yellow Fin and Binjte. I like Irish Eyes and Territorial for buying local potatoes online or from catalog. However, if you can't find the variety you want there, check out Oregon State University's Potato or WSU Potato Varieties pages which appear to be decent lists of the popular varieties and mostly tells you if they're early or late. Again you want late for towers or hilling. Build-As-You-Grow Bins seem easy to build and hopefully will last a few years. I won't be using pressure treated wood for both the weight and potential health issues (though the new treatment doesn't appear harmful). I anticipate using good ol' shop pine 2x6s and I'll recycle some of the extra 2x2s I bought when I redid my windows. The 2x2s were used for resting the bottom flange on the ground without damaging it. Since these bins will be sitting on pea gravel that I don't want dirt all over, I will line the bottom of the bin with landscape fabric and stapple it to the bottom board. That will provide good drainage and hold the dirt in. I just can't move it around like I could a garbage can. However, the benefit over a garbage can is that since you only add 6 inch layers when you need them for more dirt, the plants get great sunlight. In a garbage can, they get poor light at best. Today I went out and looked how the sun cast shadows in that corner of my garden area, only to find that the best spot was actually behind my corn bed. I've got 7 feet by about 3 feet to work with. The way I figure, I can build two bins 2.5x2.5x3 and slip them in that area if I don't move my fence line as I planned. I've got too many projects for this year as it is, so it can wait a year if I find a better potato spot. I was worried about my growing corn shading my potatoes too much, but Judy thinks that the potatoes will be done growing by August when the corn is doing it's big growth spurt. Let's hope. I'm still not set on the place where the finished bins will go, I may relocate them to the other side of the house that gets almost as much light (still southern facing) but I wouldn't have to worry about spilling dirt on my clean gravel. I could put them in my failing rose garden and dig out the weedy soil and replace 12 inches or so with Mel's Mix and set the bins without the landscape fabric. Pretty much the same idea as the article suggests. Let the roots grow into the ground and the potatoes grow up in the air where you can rob them whenever you want. The tools I used included my tape measurer, square, screw gun, drill bit, skill saw and saw horses. That's it. Pretty basic. To begin, I cut my 2x2s into 33 inch lengths (4 of them). 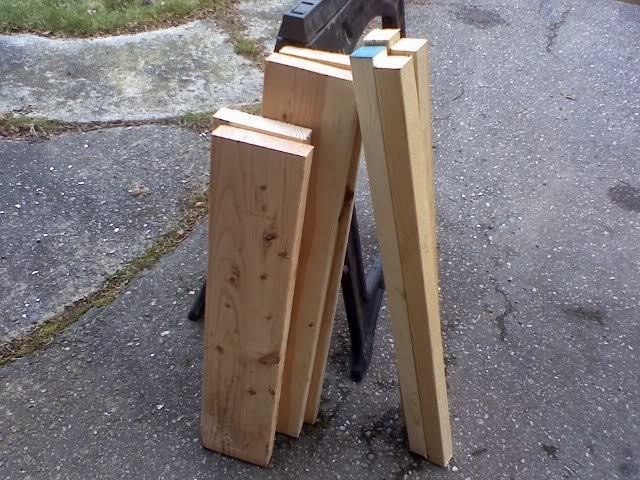 Then I cut one 2x6x10 into two 30 inch and two 27 inch pieces, with minimal scrap. In the foreground you can see the 2x2s leaning on the right. In the background you can see all the 2x6s in the truck. You need 6 of them to build the bin, but only one to start. I have so many because I bought all 12 because at $4 a piece you couldn't go wrong. When you're all done cutting, you will have 4 2x2s 33 inches long, two 2x6s 30 inches long and two 2x6s 27 inches long. 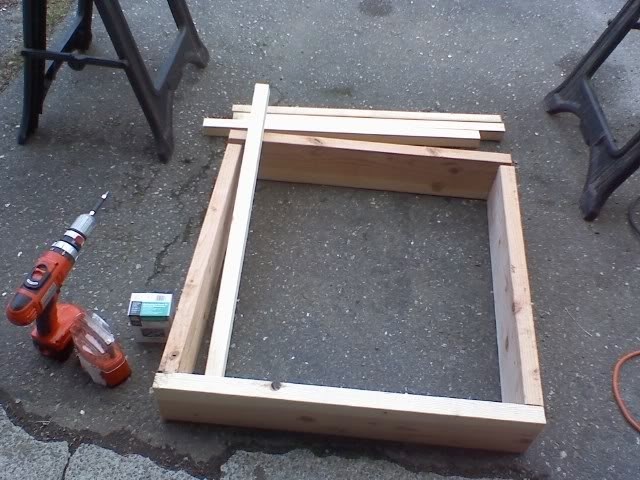 Before you do the final assembly, lay it out and mark where the 2x6s will be screwed into the 2x2s. 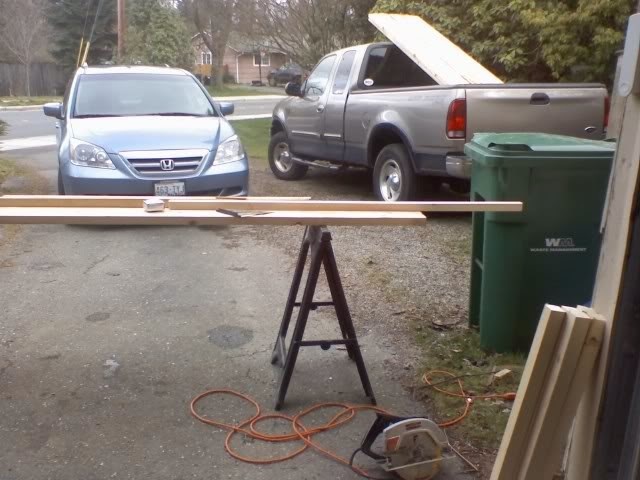 Then using a drill, or screw gun with a drill bit, drill pilot holes in the 2x6s so you don't split the wood. Then I actually started the screws all the way through the 2x6s so I only had to screw through the 2x2s. Note when assembling the box that the 27 inch pieces go on the inside of the 30 inch pieces to make a 27 inch inside square. The 2x2s go on the inside for support and ease of attaching the next layer when growth warrants. Final assembly was harder than I thought it would be because the 2x2s kept flaring away from the 2x6s and wouldn't draw back. It would have been much easier if I had clamps to keep them together, but it worked in the end. All in all it took me approximately 3 hours to build two bins to this point. It started to rain and light was failing me or I would have also cut all of my 2x6s and stacked them up so I would be ready to install them whenever. So now if you wanted to use this with your SFG to build up instead of down, just rest it inside your beds and plant your seed potatoes. As the article says you can get up to 100 pounds from this contraption. It's well worth it! I could paraphrase the article, but thanks to John Saul and Greg Lutovsky, I don't have to. Read the linked article at the Seattle Times above to find out how to use this to it's greatest advantage. Build-As-You-Grow is the way to go! Now that you've got your bins built, it's time to find the perfect place for them. 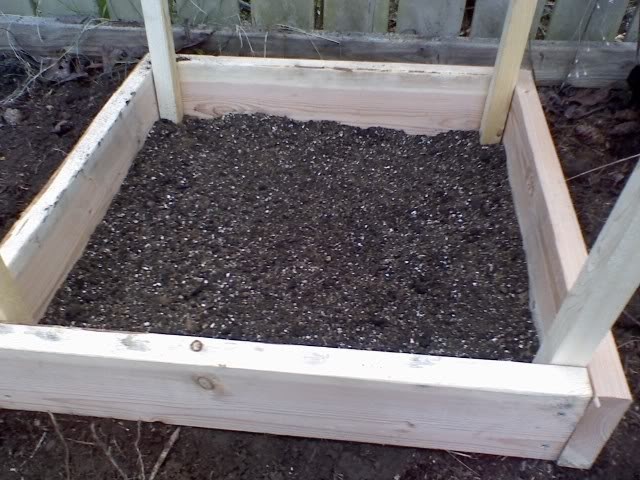 I couldn't find out a great way to fit a bottom to it that wouldn't rot (though plastic with holes drilled into it would work, screwed to the bottom 2x6), so the next best option is to set it on top of dirt. This could either be in your existing garden, or someplace that gets full sun in your yard. For me, I didn't want to use up space in my raised beds, so I settled on a spot right next to my fence on the other side of the yard. I dug down 6 inches, removing any weeds and roots I found, in the general shape of my bins. Then I set the bins on top and filled with my left over Mel's Mix. It should be great for potatoes since the goal with potatoes is to keep the soil moist without letting them dry out, which leads to mishappen tubers. 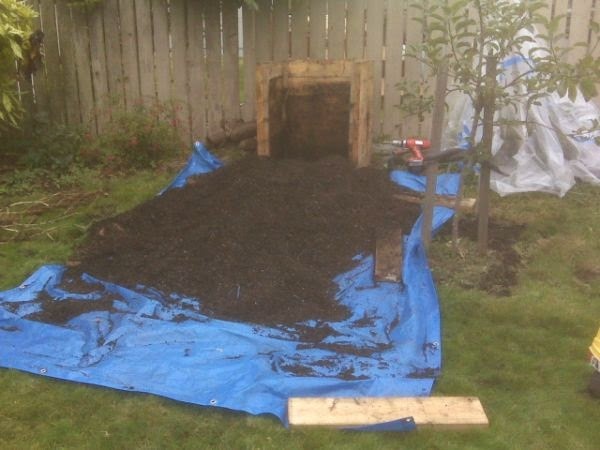 The vermiculite and peat moss do great at holding moisture and allowing for drainage. 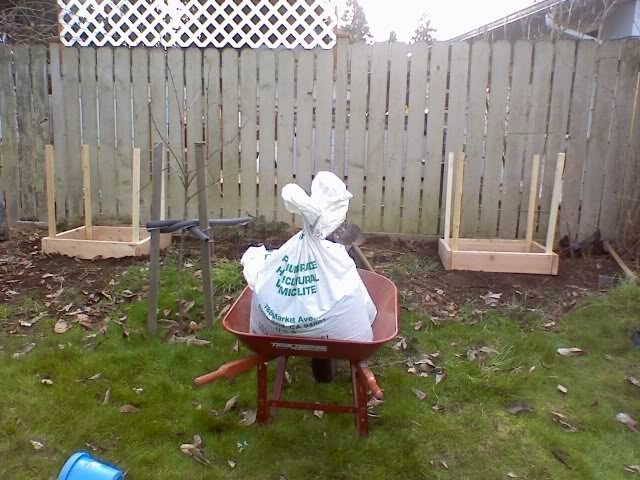 Now I've got Mel's Mix up the sides of my bins about 1 inch, so I can plant the seed potatoes in 7 inches of "dirt" and then have 33 inches to go up, for about 3 feet total! One slight change to this last pic. I got a new roll of landscape fabric so I just dug out the Mel's Mix, lifted the bin, laid down landscape fabric and put it all back like you see it. That way no weeds will grow up into the mixture. I am all ready to plant the potatoes when I get them (should have them by mid March). Of course, if you save some seed from the harvest, the next year you have second generation seed that will be pre-sprouted come planting time! 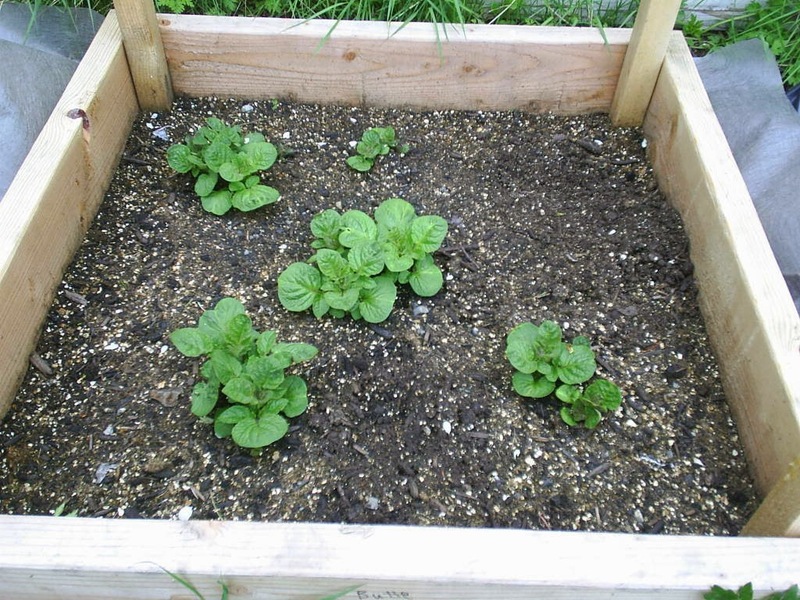 According to Ciscoe's potato site (local Master Gardener of some renown), osmocote (14-14-14) slow release fertilizer works well at initial planting, but fertilizer for acid loving plants works well too. I just bought some of that for my blueberries, so I may try a light dose of that. His advice matches that of the Times article about letting the vine grow 4 inches then cover 3 of them, always letting an inch stay above the dirt line. 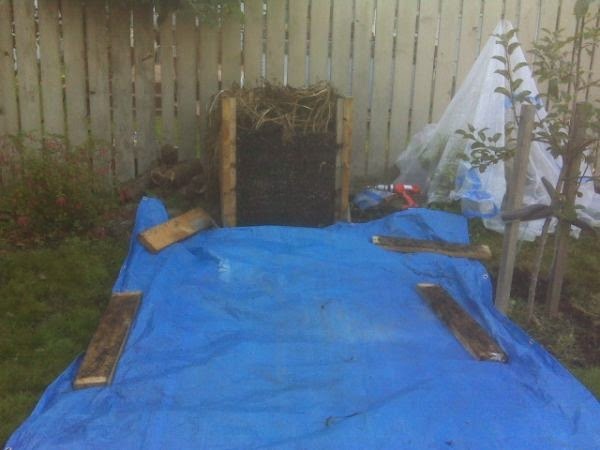 Though he suggests using 100% compost to fill the bin. I think I'll use Mel's Mix for the all-important moisture retention feature. The stuff I've got pre-mixed is heavy on compost anyway, so I should be good. I know it's early to be talking about harvesting, but whenever you take a board off, I recommend using a tarp to drape around the three sides of the bin where the board's coming off. That way, any dirt that falls out (and it will), will be caught by the tarp. You can then put it back with a trowel. Ok, I checked the SFG book and wanted to remind everyone (including myself it seems), that you don't plant potatoes until the soil temp is 45 degrees or higher. You can use a regular digital meat themometer to tell you, just wash it before using it for food again, hehe. Another thing I learned recently is that while potatoes can survive a frost while they're underground, the stems are damaged by frost and it can hurt your yield. So I'm going to consider a frost guard for my bins. I'll describe whatever I do here to help others out. 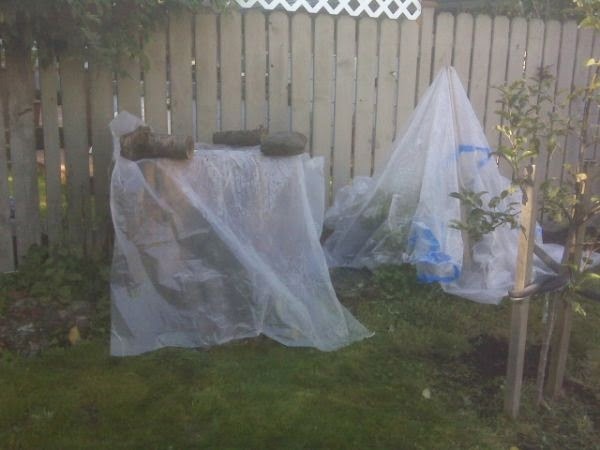 Instead of making frost guards for my bins, I just waited until the threat of frost was over (hopefully for good). 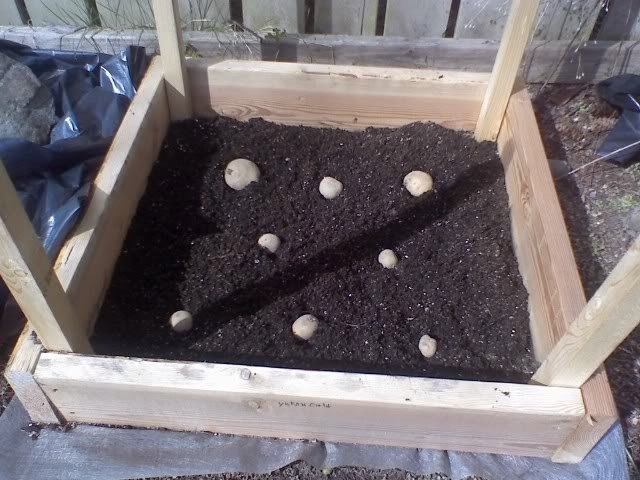 Today I planted my potatoes. The soil temp was 55 degrees compared to a minimum of 45, so I was confident they'd grow. 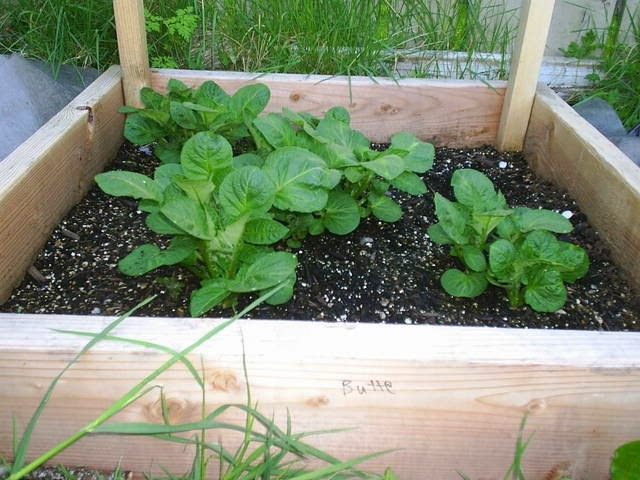 Here's a pic of my Yukon Golds with about 6 inches of clearance around them. I threw about 2 inches of dirt over them. So now they're burried 2 inches deep with 3 inches of dirt under them for root growth. In case you're wondering. I covered these with about 3 inches of Mel's Mix after I took this picture. It's been approximately 20 days since I planted these puppies (April 3 to be precise), and nothing's happened since. Well, not nothing, just no sprouts. We've had a frost or two, 4 inches of snow and countless nights of near freezing temps. Research told me that potatoes under ground are fine in light freezes. It's not until the sprout that feezing temps and frost will damage them. That said, we had what I hope is our last frost today, and then the day was beautiful. On my regular inspection of my garden, I noticed the dirt was cracking in the bed with my Buttes in it. So I gently dusted off the top quarter inch of dirt and found a pencil thick stock trying to sprout! That means any day now I should start to see life emerge from the bins! 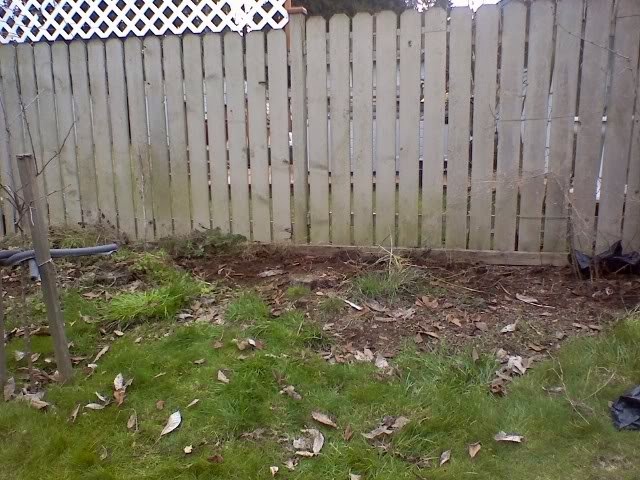 If you've seen Judy's Blog you'll know that in "her" zone 8b, she's got three boards up and plants that must be 15 inches by now (most under dirt as they should be). So, even though I encourage you to check back to see how my bins produce over the season, you can get a sneak peak of how they're SUPPOSED to look from her blog. And while you're there, see how amazing the rest of her garden is growing! She's impressive! 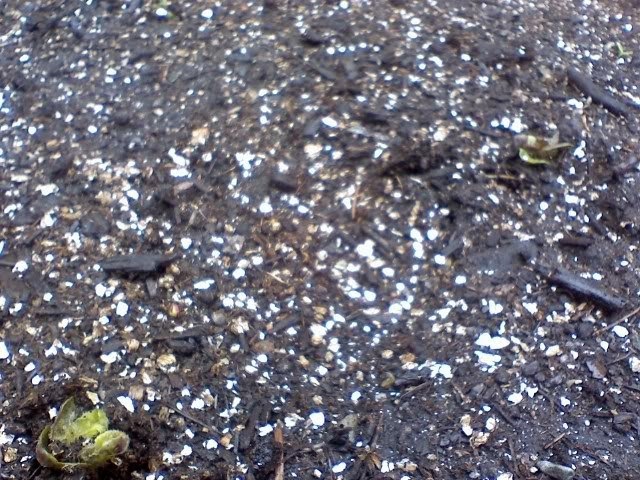 In case you want to see what the beginnings of potato plants actually look like, here are the first sprouts in my B-A-Y-G-Bs! This picture is from my Butte russett bin. My Yukon Gold has only two sprouts now while my Butte's up to 5. 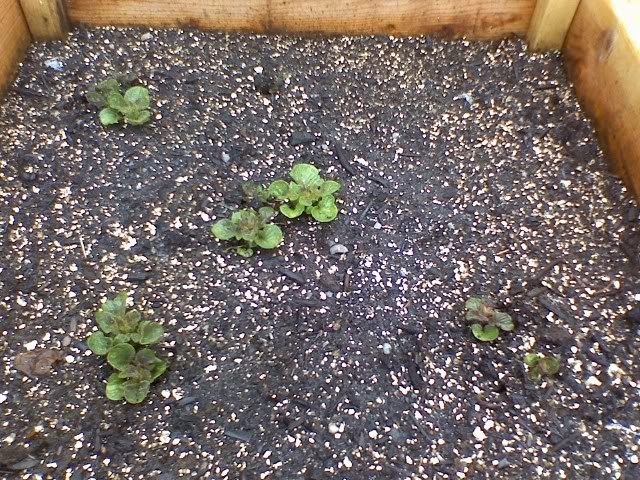 However, my Butte seed potatoes are sprouting from more than one eye. So I've got sprouts right next to each other. Apparently this isn't a bad thing to have multiple plants from the same potato. The more vines the more potatoes. Here's my Butte's at the beginning of May. My Yukons are progressing, but nowhere near as rapidly. I'll keep this updated as to my progress. I hope you find this page as helpful as it was fun making it! Unfotunately the top right corner hasn't sprouted. I hate to leave it behind but it's almost time to add dirt. Good thing I can slope the dirt to cover each plant appropriately with the top 2 inches remaining uncovered. Well, mid May and I finally found that my plants had grown enough to add dirt... NOTE: I just read that at this point you definitely cover all but the very top leaves to avoid letting sun get to the stalks and lower leaves. Ciscoe says at 4 inches cover all but the top inch. The concern is apparently if the stem and leaves get too much sun they don't produce potatoes. That would be horrible to do all that work and get nothing. So I dumped dirt over it and mounded it up to leave two inches uncovered of each plant. Thankfully the seed potato in the corner finally sprouted so I took it out while I was adding dirt, then burried it just under the surface of the higher dirt level. Let's hope it catches up eventually. Next growth will require another board, so I'll cut 8 more boards to have them ready to go. I'd recommend cutting them all, but I was lazy when I was building these, and it started raining. hehe. As the weather heats up, the growth becomes faster and faster. It wasn't but a few weeks and I had to add a second story. It was after I'd cut the boards and gathered the tools to install them that I realized putting the bins so close to the fence was a mistake. I can't get the screw gun back there. So to attach back board I screwed it in from the side instead. It should hold. Oh, don't let your bin get to look like this. You should burry the stems way before I did. And always keep "dirt" on hand to burry with. I made the mistake of needing to make more and then the weather kept me from getting it bought and mixed. I hope I wasn't too late for potatoes from this part. Remember this is my first year doing this so I'm no expert. Just interested in sharing. Note for the 2009 season. I am convinced that this error led to the minimal potatoes in the upper levels. At some point above 4 inches it seems the plant stems become stems and won't become roots. Be consistent with your burrying. Further I recommend hand filling the bin with dirt. See that jungle above. I poured the dirt from a bag into "open" sections and ended up burrrying entire plants that way. No potatoes will grow from those. Grrr. So careful. If you want to be really safe, cut down on the number of plants in the bin. Maybe you'll get the same amount of potatoes from fewer fully developed plants. Not sure. It's worth a try. Here's a pic of me finally topping out on my boards. After I installed them I filled in carefully around the plants, burrying the lower branches but keeping the current bunch of blooms uncovered. Now a note on watering. I chose Mel's Mix for it's drainage, but mostly it's water retention properties. Potatoes that don't get constant moisture are mis-shapen at best, so it is important to water regularly, but don't drownd them. With Mel's Mix, I would just deeply water the bed every three days in the spring (unless it rained), but every day or two in the summer. If you're not sure if you have good water penetration at the bottom of the bed, you may consider drilling a drainage hole in the bottom board, or wedging a small drain pipe under the bottom to tell you when water starts coming out of it that it's well watered. These are only a few options for solving the deep watering problem. Just make sure you do it. Now I want the plants to grow as big as they want and flower at will. Note that friends of mine in other parts of the country have had mixed results with this method. In fact, I have yet to see anyone get 100 pounds from one of these. I'm still hopeful and will continue to experiment with this method as I still don't have enough room to do a traditional hilling method in rows or beds. Update: I harvested the Yukon bin and got 10 pounds in the bottom six inches, see my note above. I'm hopeful that I can get closer to 60 pounds out of the Butte bin, but I'm going to wait until October to harvest. Update: Well, it's October and I covered the dying branches with plastic for two weeks to allow the dirt to completely dry out. Note that the green at the bottom are actually weeds that grew up nicely in the compost that spilled out onto the ground, hehe, very fertile stuff. Once the tarp was down, I used my hands to push the dirt out onto the tarp. I didn't want to risk piercing the spuds with a fork or spade, so I did the harvesting by hand. As I found the russets, I tossed them onto a tarp and let the sun dry them. I'm told a rule of thumb for potato harvests is 10 pounds per pound of seed. I got 25 pounds for my one pound, so I guess I shouldn't be too disappointed about the results of my first year planting potatoes. Still it's nowhere near the 60 pound average that Greg Lutovsky's customer's experienced. In hindsight I think I got lazy in hilling my potato plants as they were growing. Sometimes I would let them get to be 8 or so inches tall and jungle-like before dumping more dirt in and covering the stems. I now know that causes the plant to become a stem rather than a root, stopping growth. As it is, I didn't get much production in the top part of the bin. I think that's the reason. Remember, constant vigilance! I should edit this to say that I took all my Mel's Mix that I used to plant my potatoes and stored them in vermiculite and compost bags that I saved. I've got over a dozen bags of Mel's Mix stored on the side of my shed. I know you're not supposed to use these to grow potatoes in next year (though I understand the next year may be ok). I also realize that what I'd like to use them for, my tomato SWCs, isn't great either because both tomatoes and potatoes are nightshades. Still, I expect I will use the soil in my SWCs to plant tomatoes and cantaloupe. The next year I will likely go back to potatoes. This may not work, but I can't use straw in the PNW (it rots and molds), so I need to use the dirt and don't want to waste it. Anyway, once you've got your potatoes harvested and dried, the best method for long-term storage is not to remove all the dirt from them, just brush off a bit with your hand. Potatoes like dark, dry, cool and well ventilated places to hang out. Thanks to a local gardening buddy, here is what I did. I got a banker's box (any box will do) and drilled holes in it for ventilation. Then I laid down a layer of shredded paper (straw would work great but I'm fresh out of hay). On top I placed a layer of taters with a bit of room around each one. Then you just keep layering moisture absorbing material and potatoes until you are done or reach the top. Note that you don't want to store any buised or otherwise damaged potatoes. Hold them out for near-term use. They won't last and could cause the rest of the bunch to rot. Hand harvesting like I did made sure none of my skins were broken. Kept this way, I'm told potatoes will last upwards of a year. Not that 25 pounds will last my family nearly that long, but if you had mutliple bins, you could easily feed your family for a year. Note that mine didn't last nearly a year in storage. Around February what we didn't eat sprouted despite being in a cold garage with no light, plenty of ventilation and moisture absorbing paper. Much as I hated losing the good eats, I was happy to have presprouted potatoes ready for planting in mid-March. Sort my blog by the potato category and check out the posts from March of 2009. You will see some pretty amazing differences for this year. In encourage you to think about growing potatoes, they're high in protein and vitamins (eat the skin!) 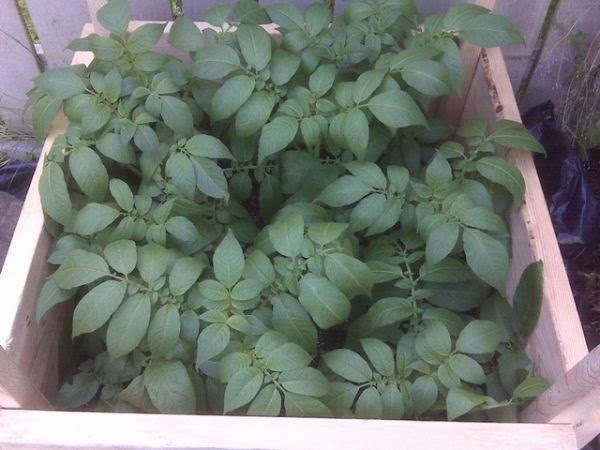 and you can even save seed for next year buy holding out the smaller potatoes in a separate box done up just like the box above! Well, I've now chronicled a year's worth of design, gardening, harvesting and storage. I hope you got a lot out of this page and just maybe this system is right for you in your garden. Good luck and enjoy your garden! Hey there, if you've come from the new potato bin story from the Times or any of the awesome viral sites, I hope you enjoyed last year's potato bin adventure. In case you weren't aware, I grow far more than just potatoes, in fact this chronicles only one small part of my suburban 140 SF garden. So I hope you come back often to read the rest of my blog and comment. Awesome. I'm gonna do this. Did you plant grocery store bought potatoes or did you plant the starts from Lowes or Home Depot? I have read that the potatoes from the grocery store wont grow because the are chemically treated so that they won't sprout in shipment or on the grocery store shelf so you should never buy grocery store potatoes to plant because they won't grow potatoes but the plant will grow and not produce the potatoes. Get your potatoe starts at the nursery or Lowes or Home Depot as they are not chemically treated. We made our potato bin this weekend, very excited to see how it goes! We're students and didn't have much of a budget for wood, but the hardware store near us gives away pallets, so we grabbed a couple and pulled them apart... they may not last many years, but it's not bad for the price! Where might one find a list of potato varieties that would work well in this type of system? Beryl, Good question. Russets are a good start, but after you asked, I did some searching. I didn't find a large list. I swore I've found more than a few varieties, but maybe they're just not available right now. Any late season or 115 or later maturing should work. Avoid new or early potatoes as many, if not all, are like Yukon Golds. I can't tell you how dissapointed I was to dig into that bed and find 3 feet of dirt and ~2 pounds of potatoes at the bottom. I haven't tried this yet, I have definitely considered it, an old man who used to come to a restaurant I served in when I was a teenager told me to do basically the same method with used tires. You start with one tire, and just add another on top the same way you are adding your 2 x 6's. 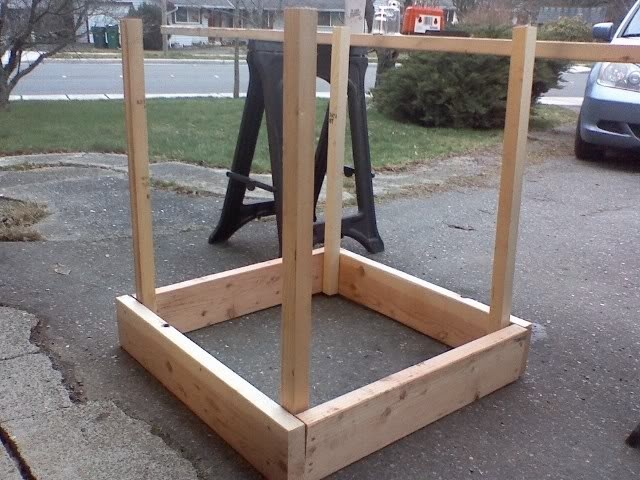 I thought it might not look so nice, but I am working on building a raised garden, and it might work in there next year. Likely your red potatoes were early season, especially if they died back this early in the year. Late seasons are the only ones that work in this, or any stacking method. Make sure you get late season varieties. Best of luck with your future crops! Thank you, one more thing when adding dirt are you suppose to cover the leaves with dirt. The reason i ask when i added dirt i was careful to pull the leaves out of the dirt or does it matter. Yes, you cover everything up, leaving only the top "seedling-like" leaves uncovered. This is critical as the stem won't become a root if left uncovered for long. It's not easy to get right as I found out. Good luck! There are a lot of pages for building a Potato Tower but yours is the best page. I bookmarked it years ago, bought a new computer and lost my bookmarks. PANIC!! I searched and searched until I found your page again. I love it. The photos are clear, your materials list handy and thorough. I bookmarked it again. This is the year that I will finally construct our towers. Thank you! I like your idea. 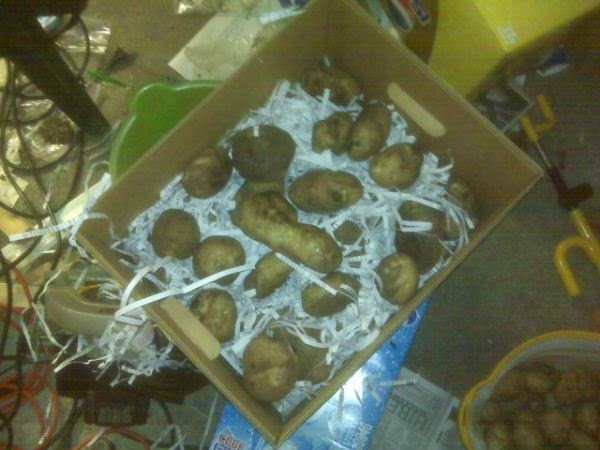 I have just started growing potatoes myself in Idaho... you know, where they really know how to do it! My neighbors brother is a potato farmer and he gives us seed potato. After not getting very good results the first year he told me that I must let the potatoes stay until a freeze hits them and the greens die. Wait 3 weeks and then harvest... but be sure you dont get a deep freeze or the potatoes in the ground will freeze too and be no good. I have old moving blankets to cover the beds with if necessary. After 3 weeks the potatoes will get hugely bigger! I did it this year and I was amazed. Your 25 pounds could easily turn into 75 or more! Professional potato farmers, I found out from him, have some kind of spray that they spray the greens with to kill them, a couple weeks before the first freeze. Then they let them sit and get big. That way they dont risk loosing by risking exposing them to a freeze. But their crops but they ain't organic! Who knows what that spray is and what if it goes into the potatoes. Very nice. 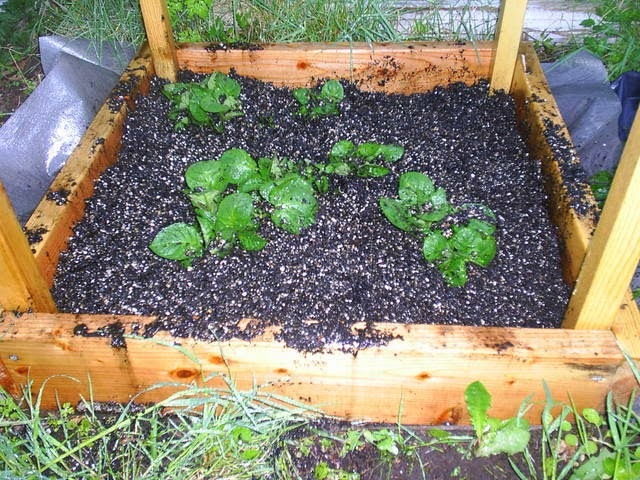 This looks like a great way to use in small spaces and yards that don't have room for potatoes in rows. You can use your forms over each year. Like many others, I had a disappointing harvest my first time out with this. Told my husband to get the camera to record the bounty as I hauled it out,and ended up with a red fac, about a dozen nice yukon gold potatoes, and 2 feet of dirt. Reading around the web it sounds like the jury is out on whether this method works with ANY variety of potato,but I'm still hopeful and would be very grateful for suggestions of a better variety. Will ANY late season type work? Thanks in advance! Yes, I'm told any LATE season variety will work, I included two above that work we in the Pacific Northwest from Irish Eyes. This is great information. Thanks for posting AND updating so we could see how things went. I'm going to start building my towers this weekend. I will probably be mixing up some Mel's mix. I'm also in Seattle and was wondering if you have a good source for vermiculite. I've read that it is more cost effective to get a bigger bag, but have never seen in around. I got mine in huge bags from Stuebers in Snohomish. Not that far of drive. They also had cheap full bales of peat moss. One stop shopping. One question I have is why you need to fill as the plant grows. Couldn't you just build the tower to the full height when you plant and then let the potatoes grow down into the tower? Thanks! The roots don't grow much farther down from the seed potato. The potatoes grow from the stems that become roots when covered. Hope that helps. Quick question - how many potatoes do you plant when you start? I have an heirloom variety called La Ratte - pretty small like fingerlings and late season. Thanks! All you need is a piece with two eyes and I separate them out as shown above. One russet would be sufficient for a bin. where are the beautiful pictures I have seen ib this article? Just re-linked them. Thankfully other sites reproduced (stole) my page for their own. At least one credited me. Nice of them. Hope these stick around. Can you suggest 3-4 varieties that will grow vertically? We have a potato box and are trying our second round...we had bottom potatoes only using Kennebeck White, All Blue, Cranberry Red and Russett. But we've been trying a method suggested where only the bottom layer has dirt...all upper layers (hilling) is straw. I'm not sure it will work but others state it does for them. This would reduce your harvest mess, and the potatoes come out clean. So far our greatest challenge is not waterlogging the plants. It's hard to tell how much water to put into straw without causing rot. Any late season variety should work. Just look at that information when ordering. the images all seem to have disappeared and your contact link says "discontinued". Please come back! People, please do not use tires for potatoe growing. How many chemicals and toxins do you think are in a tire. This will leach into your food. Keep yourself and your family safe. I bought Yukon Golds to plant in my tower again because I love them and can't buy them in supermarkets. 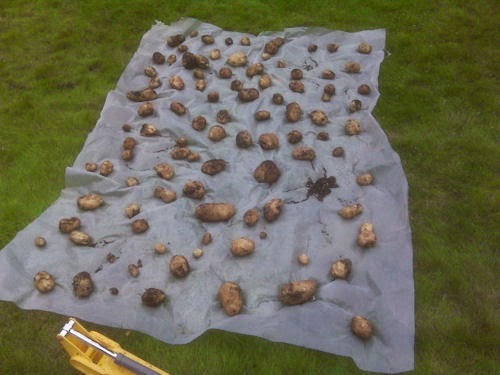 I got great results first year, not so good second year because the drainage was poor and the new potatoes at the bottom rotted. This year, I have super-duper drainage and will WAIT 3 weeks after tops die to harvest. Anticipation! To resolve the problem of putting the back boards on you can install those right away and just add the front/side boards each time. As long as they're not blocking the sunlight, shouldn't be an issue. A few notes 1) I am doing this method also. I'd point out to people that your vertical boards can warp (a problem I had this year) so you might want to consider using a 2"X 2" frame around the top to hold their shape. 2) Thank you, I now believe I hilled too late this year. I'll see what happens, but if it doesn't turn out well, I will now better for next year. Thanks again. 3) From my original reading of this method, I believe part of getting the 100#'s is by removing lower boards and harvesting new potatoes as you go. Then replacing the lowest board and letting additional potatoes develop. Then doing the same with the 2nd board, then the 3rd, etc... and then the final harvest at the end of the year. Again my first try with this as well, but that's how I understood it. Nice information, thanks for sharing the information. Keep up the good work. Have you thought about adding a few PVC tubes with holes drilled in them and filled with rocks for even watering when the box is complete. Obviously you'd put them in at the beginning and let the potatoes grow around them. Like is done with large strawberry planters. Cali, great idea on the PVC pipes with holes. That would be a good watering option for large deck planters, too. Did you leave the outside and back walls in place for the next year's planting and just build up the front wall? Thanks for the information and links. I've tried several vertical methods and was always disappointed in the few potatoes I would glean for my efforts. Now I understand why; I'm impatient for potatoes and always choose early varieties but those weren't good for vertical planters. Howdy, Thanks for information on the tator box. I just put one in. My only question is that I let the tator plants get about foot tall before adding any soil; will it still yield tators in that section? Thanks for commenting. That wasn't my experience. Cover stalks before they see much light for them to become roots. Good luck. Building demands so many things to fulfil their requirement. Some time quality of things or material are more important for us. For quality purpose every one want to usefulness of material or type of material. Thank you for such a blog. Great information.I am in Australia & planted on 2nd. September, had the 800cm high box filled with dirt by early December & now am just waiting for the plants to finish flowering & die before harvesting. It looks like the potatoes will have been in the ground for about 6 months before I get to harvest. The waiting is hard.... Cheers, Jim. Best of luck and patience to you. Thanks for the comment. Great list. Thank you. I just sent folks to the farm I got mine from. I paid full price for the taters if anyone careseen. They were very helpful when I called for advice. Looks good. One problem, don't use Yukon Gold. They are early season. See my article above. Good luck.